With already a great Bomberman game available on the Nintendo Switch, we were unsure how a Bomberman clone would fare on Nintendo’s new console, but our prejudice was immediately thrown in the wind when we actually started playing Bombslinger. Mode4 has done so much more than simply cloning a well-known franchise and updating it with a Western theme and we can only commend their hard work in the review below, even if the game is none other than a bite-sized rogue-lite adventure with a great multiplayer mode added to it. Bust out your guns, bombs and a few bottles of hooch and get ready for some explosive fun. When picking the adventure mode, the game starts off in a grim fashion where you and your former associates are introduced. You used to live a life of crime, until you found the woman that tempered your bandit side, granting you the chance to settle down and live your days on a ranch together. Sadly, fate didn’t have it your way and your former bandit companions have raided your house and killed your wife which is easily more than enough reason to once again pick up your mantle of violence and wreak havoc upon those who sought to destroy your tranquil lifestyle. You, the feared ‘Bombslinger’, will have to work your way through the different banditos in order to reach the Gunslinger, who leads the pack of miscreants. Don’t expect too much in terms of story progression, but the story that is present is certainly charming and does the trick to make the player press on towards the hard to reach end goal. 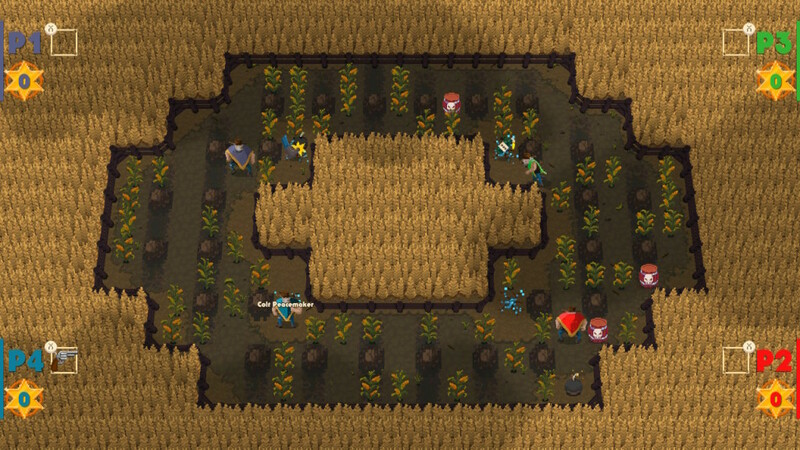 Bombslinger is a pixilated 2D game that is viewed from a top-down perspective, just like the regular Bomberman games. 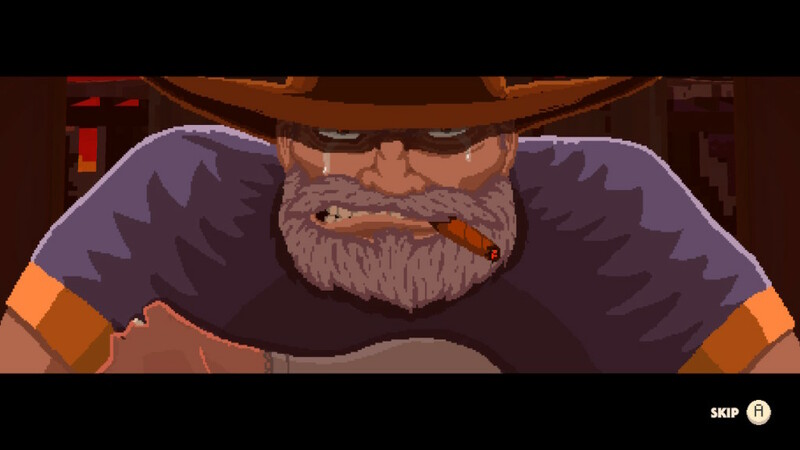 Nonetheless, while nearly everything is rendered in a 2D style, there are a few snippets that are animated with 3D models, which look a bit odd at first, but highlight certain events, such as the shopkeeper view, the opening of the boss gate and so on, which actually add some depth to the already sleek and fun animations. The overall diversity of the enemies and the environments has been handled with a lot of detail, as far as a pixilated game can go and manage of course. You’ll see smooth movements with all characters and the animations have been designed with care. The explosions are equally as fun to watch, as well as the attack of the smaller enemy grunts and the bosses. Even though the music is a bit on the repetitive side, it’s amusing to listen to and doesn’t really get boring, even after the umpteenth loop. The music is catchy and sometimes a bit on the adventurous side, which suits the game and its setting perfectly. On top of the bomb and gun sounds, you’ll occasionally hear a redneck cheering when you level up, which sounds a bit silly, but again fits the game’s atmosphere perfectly and is a distinct sound to let you know you’ve made a bit of progress. The sound design of the game was also handled with the topic and setting of the game in mind and we can only commend the developers on a job well done. Bombslinger is a Bomberman inspired rogue-lite game, which has a fun adventure mode, as well as multiplayer possibilities, with the latter being pretty much the same as a standard Bomberman title, with power-ups and so on. 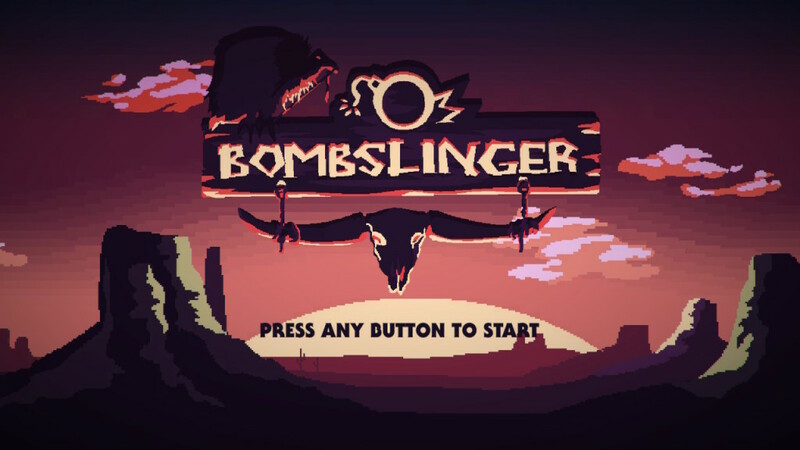 The Adventure mode will revolve around the unnamed ‘Bombslinger’, who used to belong to a posse of bandits, before he settled down on his ranch with the love of his life. As mentioned above, she loses her life in an attack on your home by those you used to work with and from here on out you’ll have to go through four stages, each with different areas for you to clear of enemies. 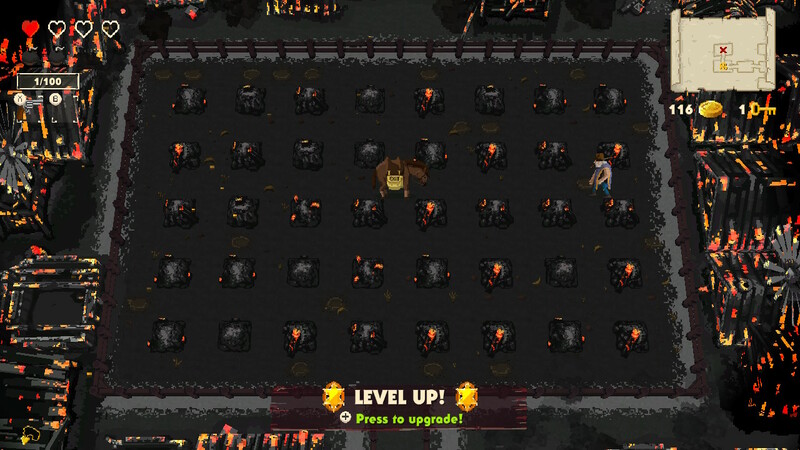 When playing through the adventure mode, each kill will net you experience and cash, the first being used to choose new abilities with each level up, and the money is needed to buy items, heart refills and so on. Overall this is also the same principle as a Bomberman title, but the different areas, the diverse enemies and the small shop you encounter in each stage is a nice refreshing take on the genre. As there is an achievement in which you’re supposed to be able to clear the story mode in 45 minutes or less, you’ll have a hard time achieving said feat, seeing when you die you start over from the very beginning, hence the rogue-lite aspect. Nonetheless, as you go, and complete certain requirements, you’ll be able to choose new power-ups to start your new playthrough with, making sure you can progress a bit further every time, if you also take in account your timing, the patterns of the enemies and so on. The multiplayer portion of the game is pretty much what you’d expect from a game like this, namely a fun and frenzied experience. You’ll be able to play with up to three friends locally, but you can also fill the slots with CPU controlled opponents. You then choose your mode, namely Deathmatch in which you just have to score a specific amount of points, or the Last Man Standing option, which speaks for itself. You then select an arena and you’re pretty much good to go. Bombslinger is a beautiful love letter to Bomberman, but the game has enough features to stand well on its own, thanks to the rogue-lite format of the adventure and the explosive fun of the multiplayer mode. The Western theme does wonders for this quirky little title, and the overall graphical quality is outstanding for a pixilated Bomberman clone. If you’re looking for a short, but hectic game for your Switch to play solo or with friends, this one is surely an asset to your digital library.